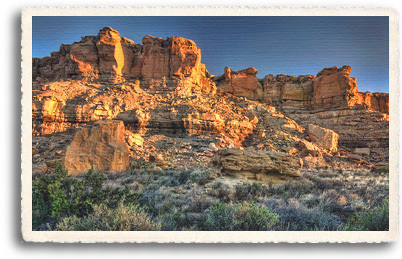 Chaco Canyon is a shallow, ten mile long canyon in the Northwest corner of New Mexico. The canyon itself was carved from ancient sea beds by erosion. Millions of years of geological history can be observed in the layers of rock and the fossils embedded there. At 6,200 feet above sea level, Chaco Canyon is high desert, scorched by the sun in the summer, and bitterly cold in the winter. There is evidence of human presence in Chaco Canyon as early as 2900 BC. Early on, humans were largely nomadic, the first farmers settling in the area built pit houses at around AD 200. Sometime around AD 850, a significant change took place. The Chaco Canyon inhabitants, now known as Anasazi, began building in a radically different style, constructing massive stone buildings unlike any seen before. The structures built at this time rose to four or five stories in height, housing up to 700 rooms and dozens of kivas. The rooms were connected to one another by lines of sight which enabled rapid communication. Called Great Houses, these structures were true feats of engineering for their time. Often built along various celestial alignments with water collection systems, they were linked to outlying communities by an extensive network of roads. This was all evidence of a sophisticated and highly organized culture with Chaco Canyon at its center. Construction at Chaco Canyon continued for about 300 years, until AD 1150, when the area was abruptly abandoned. It is not clear why the Anasazi disappeared from the area, though prolonged drought is one possible explanation. At around the same time communities at Mesa Verde and in the Chuska Mountains grew in size and importance. The residents of Chaco Canyon may very well have migrated to these areas. When the Spanish arrived in the Southwest in the 1600s, they named the indigenous peoples of the area Pueblo. This name applied to 19 distinct communities of people speaking four different languages. 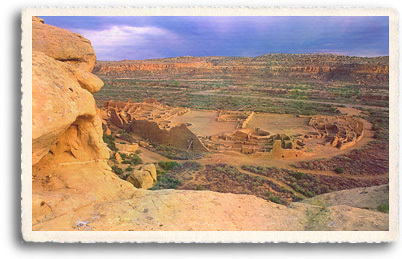 Contemporary Pueblo people all trace their roots back to Chaco Canyon, considering it to be a sacred place. Evidence suggests that the Chaco residents were expert skywatchers, with a deep knowledge of the seasonal cycles and patterns of the sun, moon, and stars. This knowledge is observed throughout the canyon in the architecture of the great houses, and in various observational and ceremonial sites. The most famous of these sites is the Sun Dagger. Here a set of spiral petroglyphs carved into a cliff face set behind three huge rock slabs functions as a solar marker. At summer solstice, two shafts of light bracket tone of the spirals perfectly. Light shafts strike the center of a nearby smaller spiral on the spring and fall equinoxes. It is thought that the dagger also tracked the 18.6 year lunar cycle. Chaco Canyon still draws astronomers for another reason  its exceptionally dark night sky. Its remote location away from city lights makes Chaco Canyon's nighttime skies resplendent with stars and other features that are rarely visible elsewhere. Chaco Canyon is the only National Park with its own observatory, where visitors can look upon the same star-studded skies that the ancestors of today's Pueblo peoples did one thousand years ago.